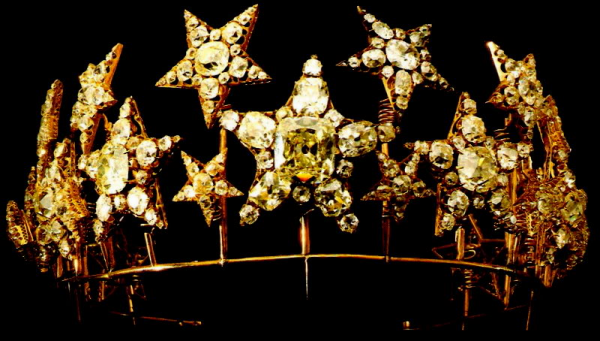 It seems like all the world is decorated with holiday stars these days, so I thought it was only appropriate to feature one of the starriest and spangly-est tiaras that ever graced a royal head: the star tiara of Queen Maria Pia of Portugal. 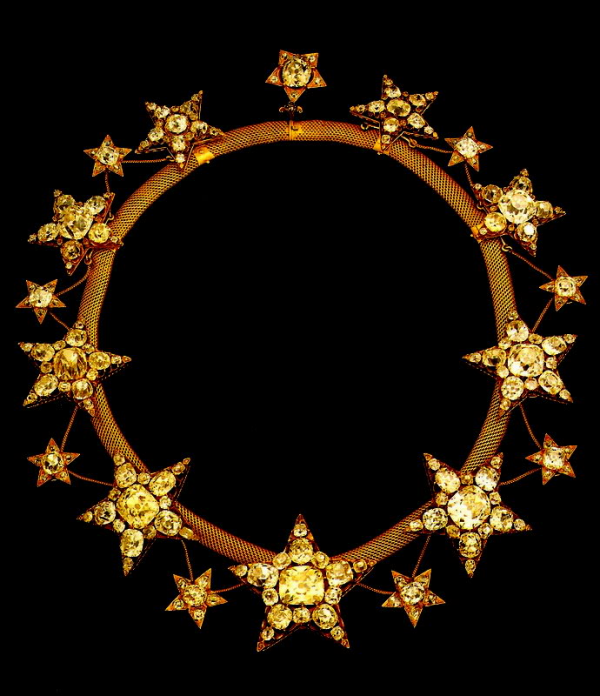 Worn in various forms during the last years of the Portuguese monarchy, the Diadem of the Stars is now a part of the Portuguese Crown Jewels. 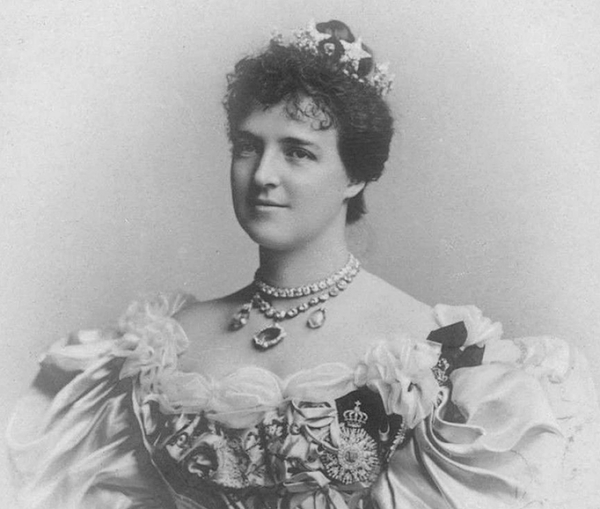 Maria Pia, who had been born an Italian princess, commissioned this tiara (and a suite of accompanying jewels) herself. In 1863, she directed Estêvão de Sousa to craft the jewels for her. It took three years for de Sousa to fashion the parure, which is made of gold, silver, and diamonds. A large yellow diamond sits at the center of the largest star in the tiara; the diamond itself is a treasure, and it’s often simply called "the Maria Pia Diamond." The diamond stars are set on spiralled wire, which means that they moved and twinkled slightly as the wearer moved. Although we see the tiara today with two rows of closely-bunched diamond stars, the piece is apparently more versatile in arrangement; early photos show wearers with a single row of stars, and it seems that they could be worn in various settings. A few additional stars could be worn as hairpins, and to top it all off, the tiara also has a matching necklace. 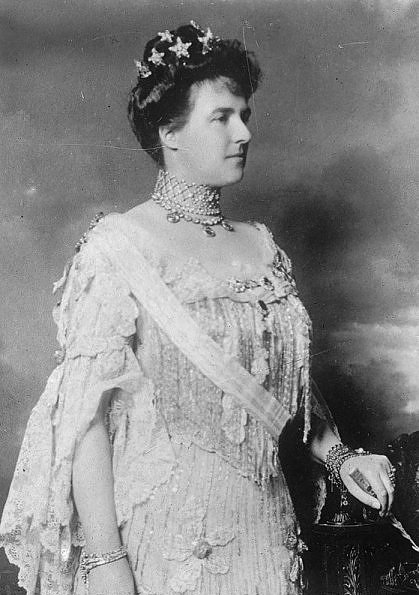 The tiara was a showstopper against the tall hairstyles of the late nineteenth century. 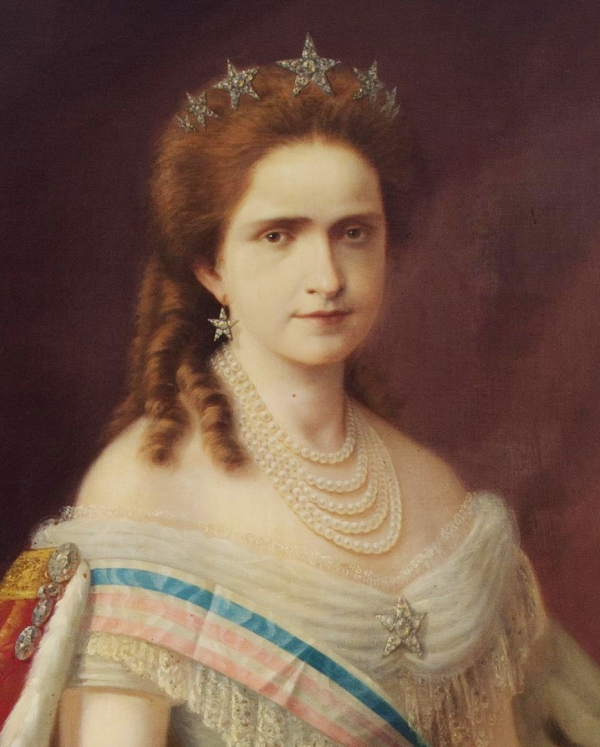 After Maria Pia's husband, Luís I, died in 1889, the tiara was worn by the next queen, Amélia. But her tenure as queen consort was a relatively short one. Her husband, King Carlos I, was assassinated in 1908; two years later, her son, King Manuel II, was deposed. The family had little time to gather their belongings, and the tiara was left behind when they fled the country. Today, the tiara is a part of the nation's crown jewels. Although the piece was restored during the twentieth century, it is not currently on display. In fact, none of the crown jewels in Portugal are -- they're held in a vault at the Ajuda National Palace in Lisbon. The collection was once on display at the palace, but a theft in 2002 that involved part of the crown collection (but not this tiara) has led the Portuguese to take serious measures to secure their most valuable jewels. Today, you can only see Maria Pia's stars when they are occasionally brought out for special exhibitions.